Rock legend David Bowie haunts in his video for “Lazarus” from his 25th album “Blackstar” dropping Friday, his 69th birthday. Playing an agitated patient in a hospital room, the famous eyes — one blue, one brown — are covered with bandages and topped with buttons. He clutches a blanket in the bed. Transiting Saturn in Sagittarius conjunct natal south node (in ancient times, Black Star, name of his last album was used to describe Saturn) & trine natal Pluto. (Rumour has it that he timed his own death – that’s a stretch, but certainly Saturn in Sagittarius trine Pluto in Leo is a good transit for the release of his album and video. It also describes the major attention his death is getting.) Saturn, conjunct the south node is indicative of a completion. (Saturn is an archetype of time, time spans, endings and end of life). Transiting Pluto in Capricorn conjunct natal Mars in the 12th: Pluto has been in aspect to this natal Mars since he was first diagnosed with cancer 18 months ago. Befittingly for the 12th house influence, he kept his condition secret, many who were close to him were shocked (transiting moon in Aquarius, natal moon in Aquarius) to learn of his transition. Transiting Mars in Scorpio conjunct Chiron in the 9th house: “gone but not done”, something remains behind (a legacy, a career, a statement of life and mortality). Chiron is always of influence during major life events. The 9th house (the archetype of Sagittarius) is a house of long journeys; (Jupiter and/or Sagittarius are often a feature of a transition.) Scorpio is an archetype of death, rebirth and reincarnation. 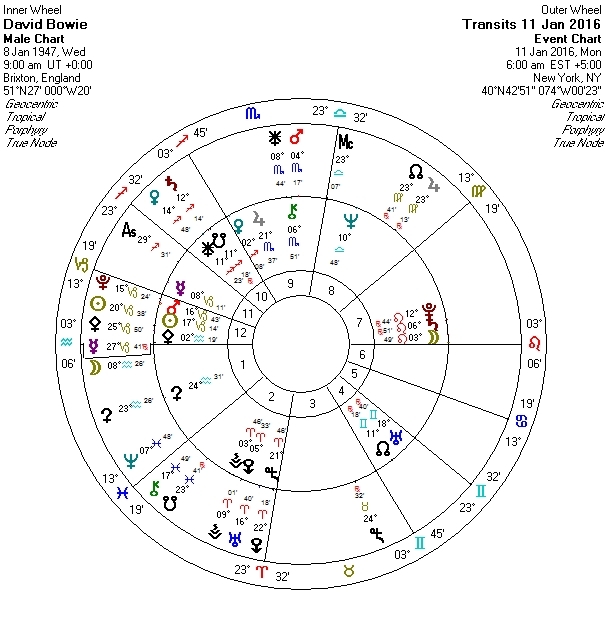 This transit is also befitting for his last song/video: Lazarus, a haunting video showing Bowie struggling in a hospital bed. 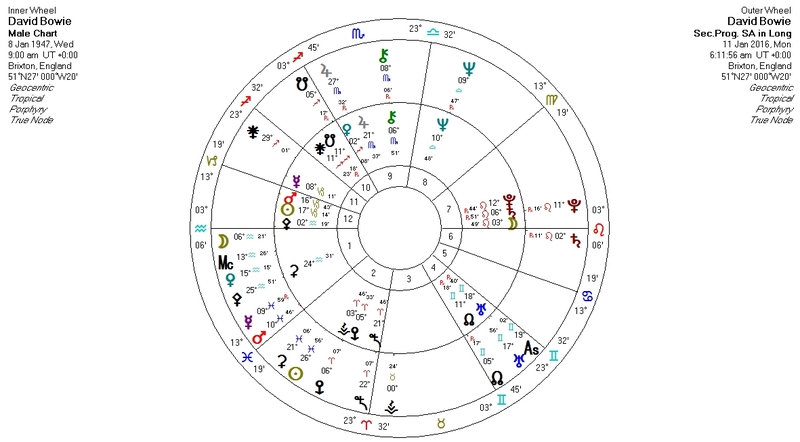 Progressed Mercury is retrograde at 9:59 Pisces conjunct progressed Mars at 10:48 Pisces (both in his 1st house); both are square the natal karmic/nodal axis (N Node 11:18 Gemini ; South Node 11: 18 Sagittarius). This skipped step to the mutual sign axis of Gemini/Sagittarius is appropriate for a transition, for the release of the album (Gemini/Sagittarius -recording/video release; publishing/broadcasting) and speaks both of “I live on, and I’ll be back”.